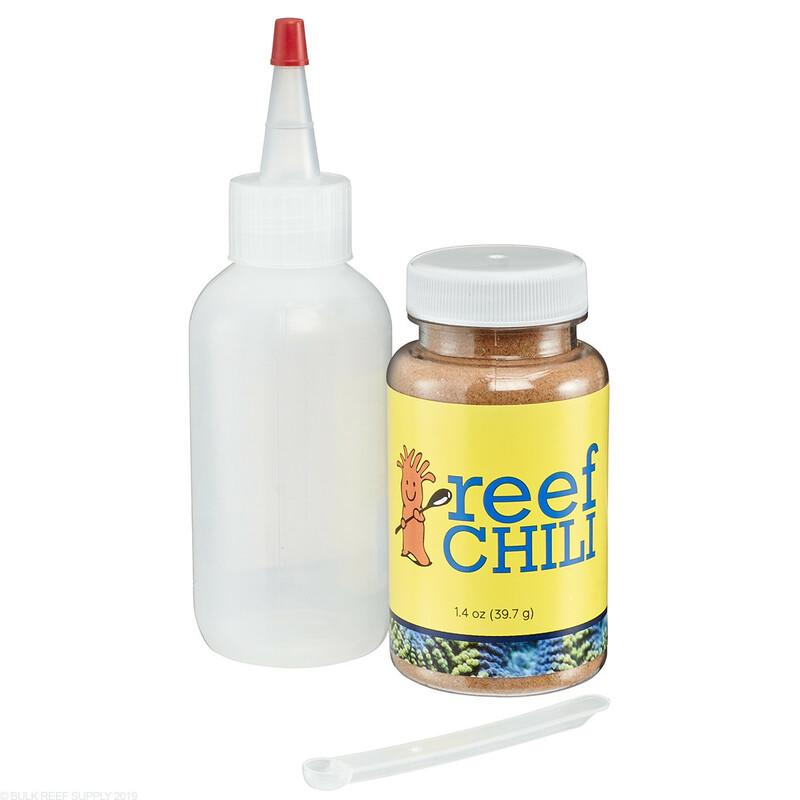 Reef Chili has been tested by universities and has been proven to help accelerate coral growth at a very low cost. With fresh ingredients that don’t need to be frozen, and is a must-have for any tank with filter feeders. 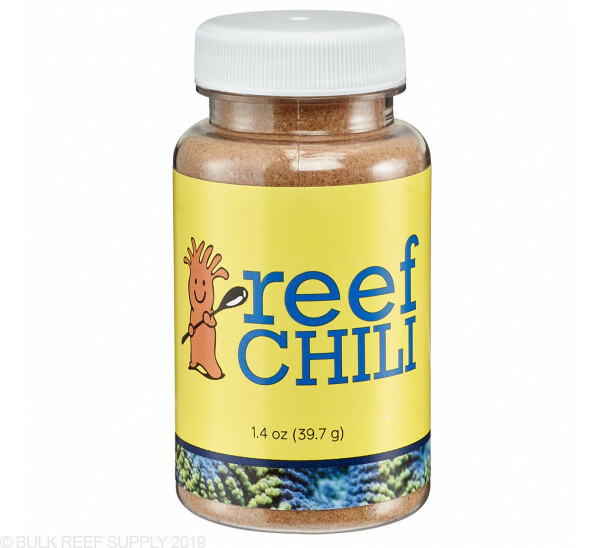 Reef Chili provides corals with all they need to be healthy and colorful in one food. Achieve faster growth. Instructions: Suggest using every other day and adjust to your tanks needs. 1: Use the included portion spoon and add one level spoonful per 20 gallons to a half cup of tank water. 2: Shake the mixture vigorously for 30 seconds. 3: Either pour the mixture directly into the tank or target feed each coral with a syringe. 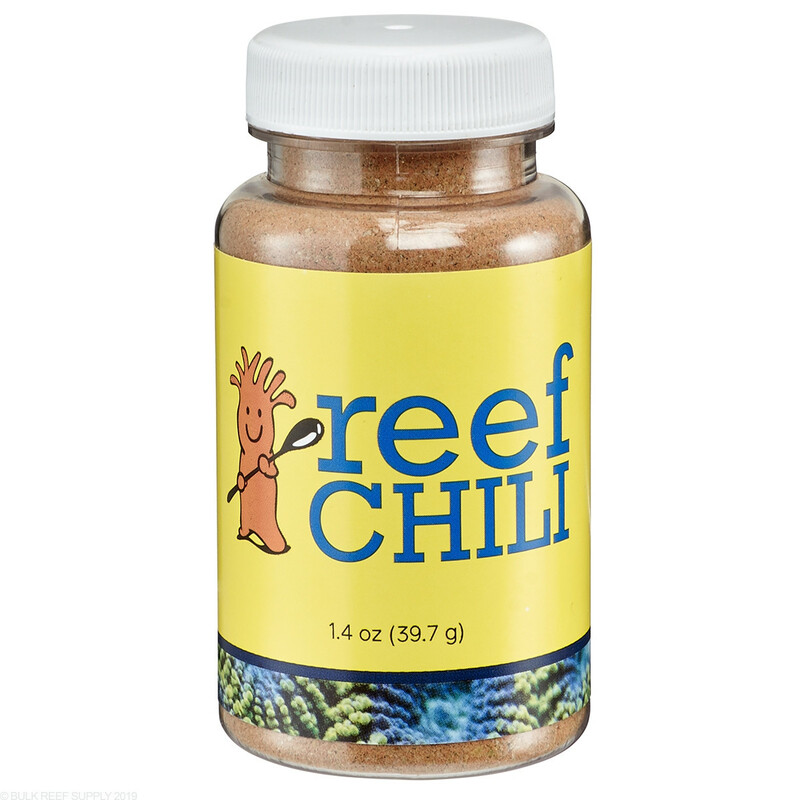 Reef Chili was originally created as a frozen fish/coral food and it worked out great, except for one thing, cost! Shipping frozen products overnight around the country is simply too expensive. Bulk Reef Supply co-founder Ryan made this product because he was tired of trying to feed his tank a dozen different things to keep all the corals and fish healthy and colorful. He also wanted to achieve faster growth rates from some of his slow growing frags and see his otherwise nocturnal corals come "alive" during the day with the lights on. All these products were frozen, expensive to ship and none of them are sold by the same vendor. He soon realized that none of this was necessary! He could make a 100% nutritionally complete food that didn't need to be frozen. Better yet, it can be done for just a few dollars a month. With this much variety, you can feel safe knowing that you have done your best to meet the nutritional needs of every filter feeder in your tank. There is absolutely no need to use any other products. Due to customs restrictions, we are unable to ship this product to Canada. Feeding time has gotten so much more interesting since I've started using reef chili. Literally every coral I have goes crazy over this stuff, and I also notice more activity from my fan worm than normal during feeding. I've heard a lot of people say that frogspawn doesn't really have a feeding response. They obviously haven't tried reef chili. Mine has gotten to the point that when he realizes there's no flow in the tank, he deflates and exposes his mouth so I can give him a squirt, doesn't spit anything back out either. You can go wrong with this stuff, highly recommend! This is the only coral food I've purchased so far, so I don't have anything else to compare to yet but my corals do respond well to it. I just received my first jar of reef chili, and I have to say that I am very impressed and pleased with the amount that actually came in the jar! You definitely get your money’s worth!! I have bought so many things over the years and this is the first time I wrote a review (it's SUPER EFFECTIVE!) I read the the good review about reef chili and the video of Ryan showing reef chili having the highest coral growth, so i decide to try it out. Since day one my duncan never come out more than 3mm out of its skeleton. Reef chili was delivered today and i decided to add one scoop of it. Three hours later, my duncan came out all the way of its skeleton and opened everything up! Reef Chili should be changed into Reef Crack because only crack can do this! If you haven't already, i recommend buying this and testing it out. Part of the reason I stayed away from LPS and SPS corals were the nightmarish mixes of different frozen foods you had to use years ago. Now with Reef Chili and Reef Roids in tandem, I can make sure ALL of my softies, LPS and SPS are not only properly fed but also thriving. I saw an immediate difference and my Montis especially are responding right away as well as my Red Goniopora. I would absolutely recommend this to anyone! My corals love this food. Used ever other day, alternating with reef roids. Feeding my Gorgonian wasn't too much of a challenge but then feeding my Red Goniopora definitely became one! One reason I've held off from buying corals was the endless advice of feeding regimines, types of food and the fact much of it was a mix of frozen and phyto (which doesn't seem to live very long). Now I've got one easy food that even my mushrooms, zoas and even palys respond to! Even after only the second feeding I've already noticed much better colors and better response from my corals when it comes to feeding. This is an absolute must have if you have corals or inverts, even fish like it! I wanted to wait a little bit so as to give Reef Chili a few weeks to see how my corals responded to it. It didn't take that long for me to see a definite difference in feeding response and growth. Both have increased dramatically. My Zoas, other softies, and LPS all love this stuff. Plus, its actually fun to feed as they seem to go crazy for the stuff. I've started adding a cube or two of frozen mysis shrimp in the bottle when I mix for even a better response, especially my Acans. I'm definitely a believer!! My corals don't seem to be responding any differently than they have been to the blend of reef food I made. IMO the feeding spoon they give you is way to small of a portion for what they recommend. This stuff is awesome! All of my corals loved it. LPS and SPS when nuts for it. The price is great and the bottle last a long time. Can't go wrong purchasing this. Thanks BRS! What's the right amount to use/mixup on a 5L pico tank? If the scoop mixes to 20 gallons in a 1/2 cup of water, I get about 6 ml of mixed chili solution per feeding session. This gives me about 20 days worth of food, but I suspect that it won't keep that long in the fridge. Should I just treat the mixed as any other food in my fridge and pitch it after about a week or so? Hi Jeremiah, thanks for reaching out! Depending on the coral in your system you may use more or less than 1 scoop/20 gallon. This will also depend on whether or not it is the only food source going into the system. Either way I toss any unused food after a few days since the nutritional value will likely begin degrade. Can Reef Chili be used to feed clams? You can! Would be a great supplement! 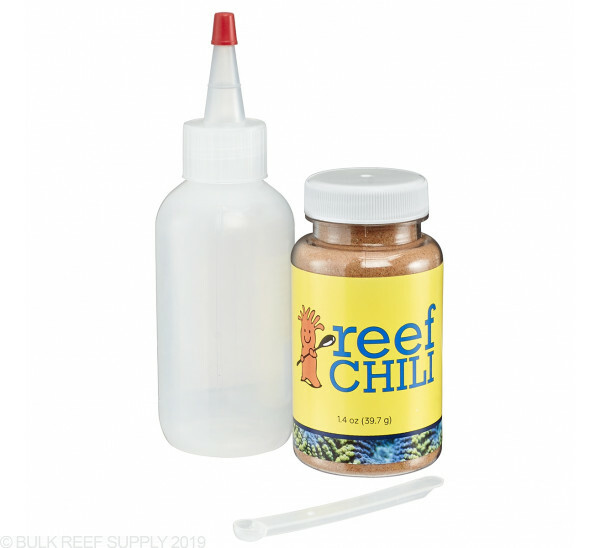 I have a question about how the reef chili product (as well as reef roids) is used to feed sps corals. I have various acropora, seriotopora, pocillopora, and montipora in my tank. They're all doing well but I've read these products will increase color, polyp extension, and growth. How does this work since the sps corals don't seem to consume the food directly as do lps or anemones. 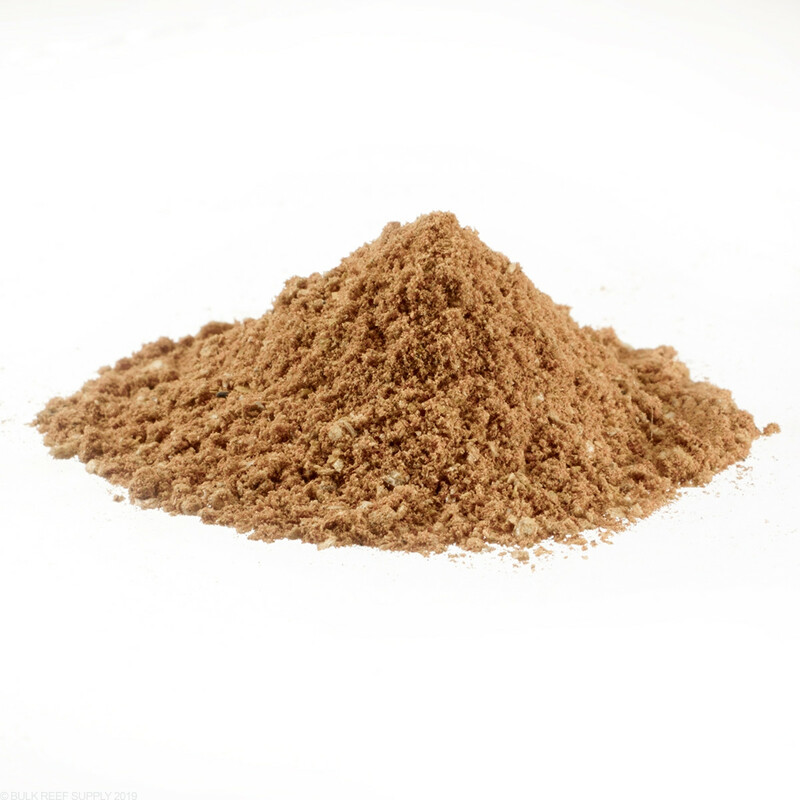 Do sps absorb dissolved amino acids or other nutrients from the water added via these foods? How should I best use these foods to benefit my sps corals? 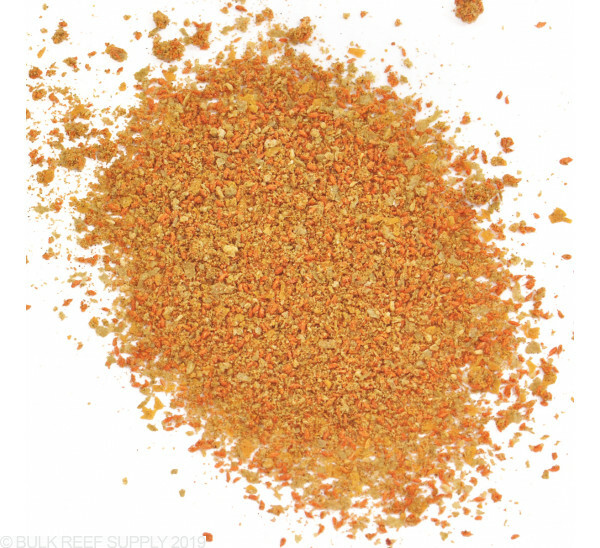 For the most part Reef chili is designed for more soft corals and LPS which can take food directly. 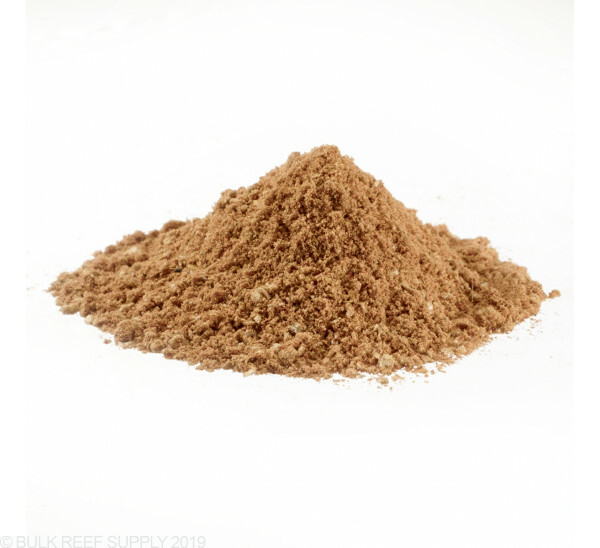 With SPS you will not need to supplement with reef shili rather using amino acid and other trace elements to supplement SPS. Feel free to let us know if you have any further questions! Can you mix a bunch of this up and use it over the course of a few months for automated feeding? In short the answer is no, unfortunately the food would being to have issue and decay rather quickly as well as settle down to the bottom of a container. Feel free to let us know if you have any further questions! What will be the best time to feed this to the corals? Hi Pedro, Thanks for reaching out! This is a bit of a tricky question in that some corals will feed during the day while others will mainly extend their feeding tentacles at night. That being said, nocturnal corals like Tubastraea (sun corals) for instance, can be trained over time to feed during the day. If you are target feeding your corals you will learn, through a bit of trial and error/observation you which of your specific corals hold onto the food and ingest it. The other option would be to feed half the Reef Chili with the lights on and the other half after the lights have been out to make sure all of your corals are getting fed. How often do I use the reef chili, and how much per gallon of water? The dosage can be done one to 5 times a week depending on your system and likeliness of the corals to consume the food. Usually one to two times per week is common. Around 1 spoonful per 20 gallons will work well and it can be target fed if needed! Feel free to let us know if you have any further questions! How long does reef chili stay fresh? How do you recommend storing it (fridge or freezer)? Before introducing the Reef Chili into the tank, would it be beneficial to turn the return pumps off for a specific period of time to ensure it doesn't go down the drain and get caught in the filter sock? it is a great idea to stop the return pump from taking away the left over food. In most cases this can be as little as 5 minutes. Feel free to let us know if you have any further questions! How does this product compare to a product like cyclop-eez? Does this come with the Reef Chili Feeding Jar? Thanks for reaching out to us. 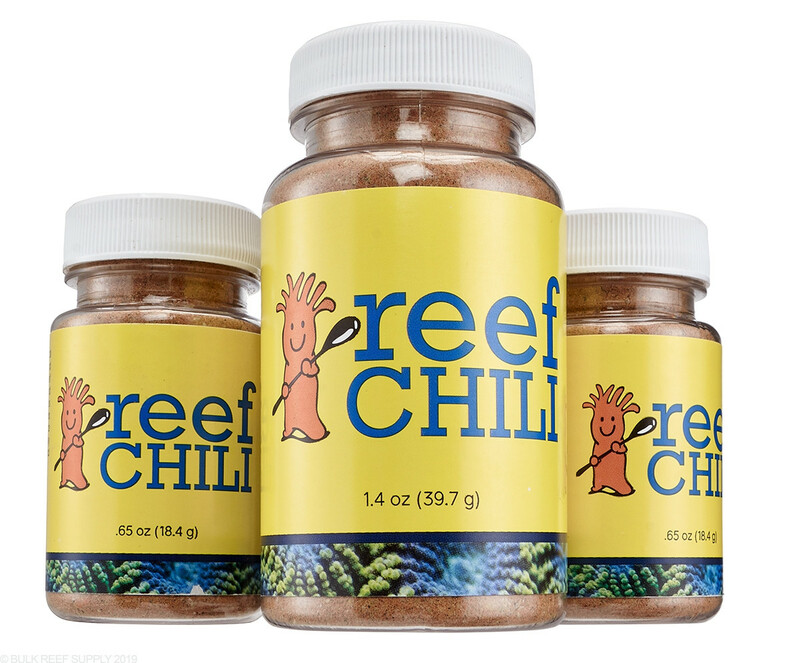 Each jar of BRS Reef Chili includes directions, a feeding jar, and a measuring spoon. Hi! Just got my reef chili, but it didn't have a measuring spoon. Can you please tell me the measurement? Thanks!! We actually pack the spoon inside of the bottle so you may need to do a little digging to find it. If you still can't find it let us know and we will get one sent out right away. You can call our Customer Service team at 763-432-9691. The measuring spoon is actually 1/32 of a teaspoon so for the time being I would say just add a pinch of Reef Chili instead of a scoop. 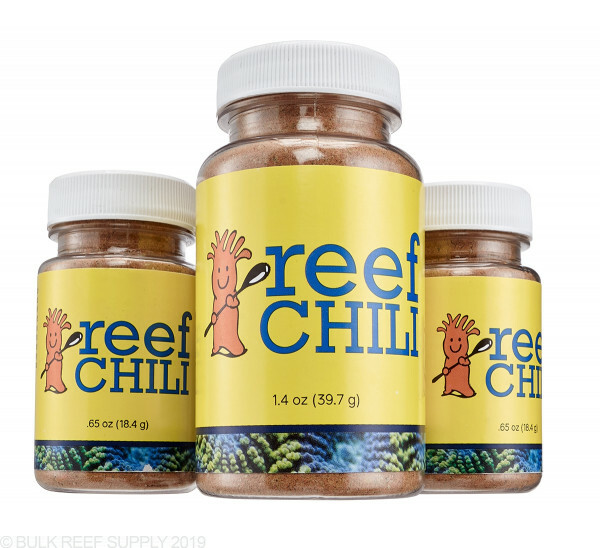 Could reef chili be used as a feeding supplement for small moon jellyfish? After one feeding my corals had their tentacles out, however when no feed the tank my fat clowns eat most of it out of the water column. They wake up and frenzy! So I tried even later at night, this time spot feeding with pumps off, and those clowns woke up and were bumping against corals trying to eat! How can I be sure the corals are getting the full benefit? By protecting the coral when feeding by using an upside down cup with a hole drilled to allow the turkey baster or feeding device through you can protect the corals from shrimp and fish. Feel free to let us know if you have any further questions! 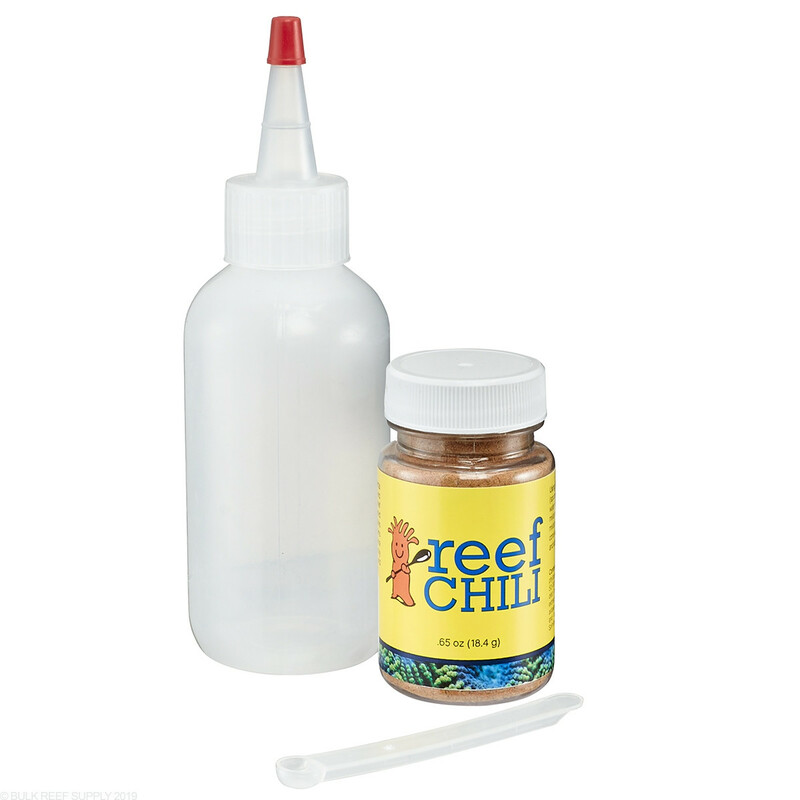 Reef Chili will stay fresh for 3-4 months at room temperature. Reef Chili will stay fresh in the fridge for 9-12 months depending on how humid and cold your fridge is. For maximum freshness always make sure to keep the cap on tight. Any time after these dates and we recommend replacing the reef chili. 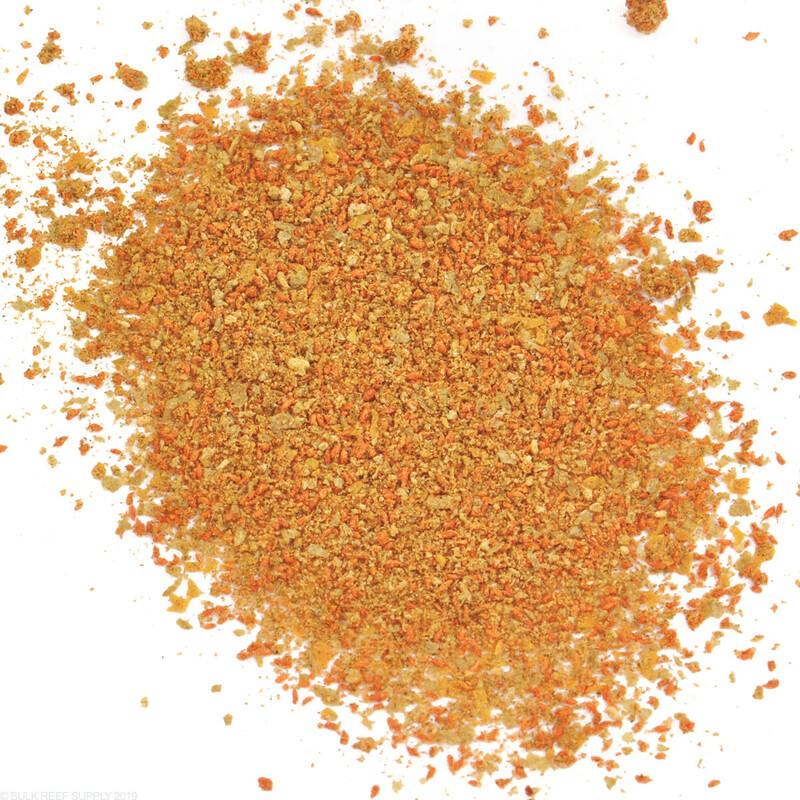 What types of corals can be feed with Reef Chili? Lobophylia for example? 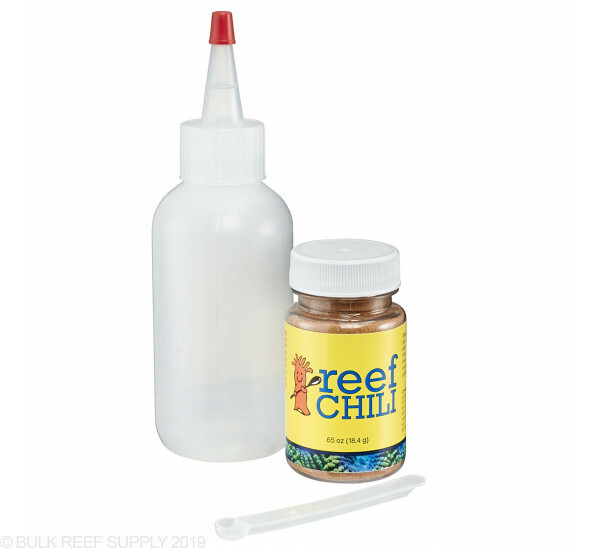 Reef chili is designed for a wide variety of corals which accept supplemental food. This is a fantastic source of nutrition for a Lobophylia and many other LPS and Softies. Feel free to let us know if you have any further questions! 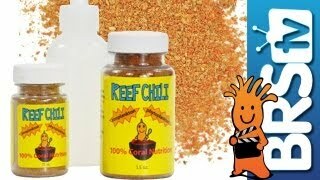 Will my fish like Reef Chili as well? Lots of fish love Reef Chili! I know my anthias go nuts every-time I add it to me tank.